China now and in the future. What's to celebrate? A dissident and a diplomat face off. A snapshot view of China. China as a communist power. Quotes from the Great Helmsman's famous "Little Red Book." China's economic and military potential. An interactive inventory of the world's largest standing army. The dynastic rule in China. 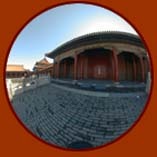 Your journey through the jewels of China's ancient past begins here. Will China see a shift to democracy? Two views: What's to celebrate?